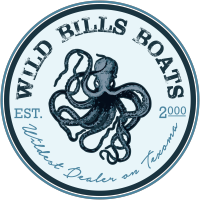 Wild Bill’s Boats is your boating dealership in Mead, Oklahoma serving the “Texoma” area including Texas, Oklahoma, and Arkansas. Give our dealership a call to learn more about events or any of the services we offer. Our OK dealership can be reached at 405-830-8486 or 580-380-2444. Shop our extensive inventory of boats like Airboats, Pontoons, Fishing Boats, Bass Boats, & Xpress brand boats now in stock!